A puzzling new cybernetic entity, Tigerhawk is the result of an advanced alien species; apprehension of the former Tigatron and Airazor. Mysteriously combined and reconfigured, Tigerhawk was sent back as a prophet of peace to end the long war between the Maximal and Predacon. Possesses elemental powers to summon earthquakes, electrical storms and tsunamis. Has Vok alien-enhanced intelligence and an incredible arsenal of weaponry including an ion diminisher that paralyzes enemies. 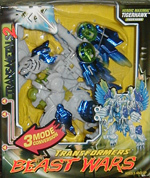 Totally fearless, noble and ferocious in battle, he is an inspiration to his fellow Maximals.